1.1.1 Ft. Worth 15 Irons: NOW CALLED FT. WORTH WHITE IRONS! 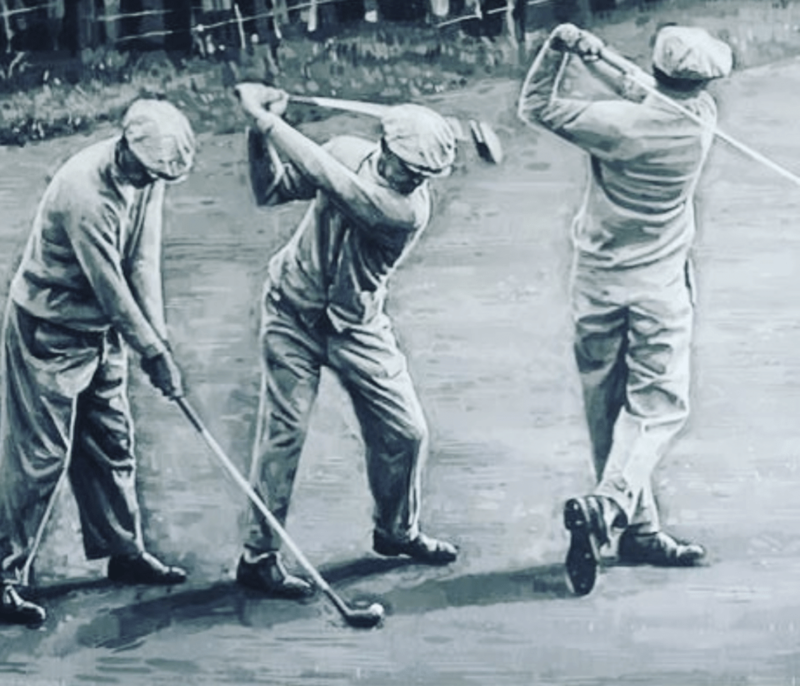 The name “Ben Hogan” is synonymous with precision, perfectionism, and exacting standards. The Ben Hogan golf clubs and the Ben Hogan Golf Company would certainly be no different. The Ben Hogan Golf Company was formed in 1953 in Ft. Worth, Texas. More recently, Ben Hogan Golf was purchased by Callaway Golf in 2003 as part of a deal for buying Topflite Golf. The company was later sold to Scor Golf in 2011 and remains in the hands of Scor. The brand relaunched in 2015 with the creation of two brand new club lines, the Ft. Worth 15 irons for low handicaps and the PTx irons for mid-low handicaps. At that time Hogan golf also offered the Ft. Worth Hi irons, VKTR hybrids, and the TK wedges. In 2018, Ben Hogan Golf added the updated Hogan Edge irons, Ft. Worth Black irons, and the equalizer wedges. I have a little personal history with the 198o’s version of the Edge irons, as intermittently borrowed them from my uncle along with a set of Ping Eye 2’s from a friend. I liked the Edge irons fine, but I loved the Pings. Ft. Worth 15 Irons: NOW CALLED FT. WORTH WHITE IRONS! These are the flagship irons for the Ben Hogan Golf Company. They are forged (as is every iron from Hogan Golf) blades and are meant for lower handicaps. In addition to being the most beautiful clubs in the world- pretty much- they are not numbered like traditional clubs with single digits for short and long irons or letters for wedges. Instead, they have the degree of loft stamped on the soles. DYNAMIC PROGRESSIVE WEIGHTING is the term used to describe the process by where they optimize launch angle for the short, mid and long irons. This is accomplished with their 1025 carbon steel construction and something they call a “Depression Cavity.” The “Depression Cavity” starts smaller and higher in short irons for a more penetrating ball flight for accuracy and gets progressively larger and moves lower in the long irons for a higher launch angle, making it easier to hold greens. V-SOLE TECHNOLOGY allows the 15’s better turf interaction by “minimizing digging or dragging.” This is achieved with a very steep leading edge with a high bounce and a trailing edge with a low bounce. **You can check out my PTx irons review in these very pages. CO-FORGED CONSTRUCTION: The long irons are hollow and are constructed of a 1025 carbon steel frame, and hosel and the face are made from ultra-thin MS300 steel for more distance and better feel. The short irons use the same 1025 carbon steel for the frame and hosel, but the face is made of titanium to optimize perimeter weighting. The Black’s are the latest clubs released from the Hogan brand. Like the original Ft. Worth’s they are simply gorgeous, but there are other differences besides the obvious color change. This newest edition is still targeted at the better player; they are still forged blades. They have been updated to be just a tad more forgiving. I’ll get to the details below. **You can check out my Ft. Worth Black irons review in these very pages. PATENTED BLACK DIAMOND METAL FINISH for both durability and glare mitigation. This is what Hogan calls their proprietary new finish. They claim it protects the Ft. Worth clubheads up to 7-times longer than the nickel-chrome finish used on their other lines of clubs. This extends the effective playability of the irons. Groves stay sharper, allowing players to impart more spin which allows them to shape and flight shots and hit and hold more greens. The black finish also helps to “frame” the ball better due to the extreme color contrast, making it easier to align correctly to your intended target and increase the accuracy of your shots. OPTIMIZED WEIGHTING SYSTEMS: They have made the irons more forgiving with a couple of minor tweaks to the original design. The “Depression Cavity” which first appeared in the Ft. Worth irons in 2015 has been modified in shape, size, and depth in 2018 for better shot making. The cavity is larger in the long irons to increase launch angle for better holding of greens and the perimeter weighting system has been tweaked in the short irons for better feel. MODIFIED V-SOLE DESIGN: The V-sole has been optimized for each club in the set by strengthening the leading edge in and reducing the trailing edge in certain irons. SIMPLIFIED PRECISELOFT SYSTEM: Gone or the four launch profile options. Due to feedback from existing customers, the “mid-high launch profile” is the only one available. The 4* loft gap between clubs is maintained. The new EDGE irons were released just this year and are an updated version was released 30 years ago, of which I’m fairly familiar. This is the “game-improvement” iron offering from the new Hogan Golf company. They are forged, like all Hogan irons, but are packed with technology to minimize the mis-hits we hackers are known for. **You can check out my 2018 Edge Irons Review in these very pages. LARGER FACE AREA – MORE OFFSET – THICKER TOPLINE: These serve the exact function you would expect them to- more forgiveness for the less accomplished player. ENHANCED V-SOLE TECHNOLOGY: This is the same modifications noted above. The leading edge now has a higher bounce and the trail edge bounce has been softened as compared to PTx and Ft. Worths. SIMPLIFIED PRECISELOFT SYSTEM: They come only with the “mid-high launch” profile- the most popular profile of Ben Hogan iron customers. And, as previously stated, there is the standard 4* loft gap between clubs. These hybrids were introduced in 2015 and feature some unique technology and designs for better performance than your standard hybrid. Hogan is attempting to help the hybrid come into its own, not just be kind of a long iron or kind of a fairway wood. UNIQUE SHAPING: These hybrids vary in Size and Shape depending on the loft. The lower lofted clubs are larger to instill more confidence at address and allow the engineers at Hogan to place weight where it’s needed most. The highest lofted hybrid at 27* is 96cc and the lowest lofted club at 17* is 110cc. They’ve moved more weight behind the impact area to enlarge and optimize the hitting area on the face. PERIMETER SHOT SHAPING TECHNOLOGY: There are 4 movable weights in the clubhead totaling 24 grams to help optimize trajectory and accuracy. You can dial in whatever shot shape you desire. ADVANCED V-SOLE TECHNOLOGY: This technology has been borrowed from their irons and serves the same purpose- to enhance turf interaction from any type of lie. These are Hogan’s attempt at a more forgiving long iron. They claim these are constructed with the same design principles as the best-selling Ft. worth irons but have a larger face, wider sole, and enhanced weight distribution for forgiveness. FORGED HOLLOW HEAD DESIGN: The head is made of two forged pieces. The face is MS300 carbon steel and is thicker than typical hollow irons for improved performance. The clubhead and hosel are made of forged 1025 carbon steel. The pieces are welded together by ROBOTS! PROGRESSIVE SIZING: The center of gravity is lower in these clubs to increase launch angle and allow them to hold greens better- pretty much the hardest thing to do with a long iron. TOE WEIGHTING: The R&D team at Hogan found that most misses with long irons are toward the toe, so they place a tungsten weight there to expand the effective hitting area of the clubface. MODIFIED V-SOLE TECHNOLOGY: Again, they’ve increased the angle of the leading edge and decreased the angle of the trailing edge of these irons to improve turf interaction. “Equalizer” is the nickname Ben Hogan’s competitors gave his pitching wedge back in his heyday because of his proficiency with that club. Hogan surmised there was too much weight in the sole of the club and the faces were too thin, leading to inconsistent performance. FORGED 1025 CARBON STEEL: For greater feel and performance. BETTER SHAPING AND DISBURSEMENT OF MASS: The higher lofted wedges have more mass lower in the clubhead to promote higher shots that land softer and the higher lofted wedges have mass placed higher in the clubhead to promote a more piercing trajectory to increase accuracy and prevent ballooning. PRECISION MILLED FACE AND GROOVES: They’ve taken the “grooving” of these wedges right up to the limits allowed by golf’s governing bodies. The groves are milled into the fave after forging and apparently, this process creates more texture between the grooves for EVEN BETTER spin and performance. ENHANCED V-SOLE TECHNOLOGY: Yep, you guessed it. The leading edge is now more severe and the trailing edge has been softened to produce better turf interaction from various lies. GAP, SAND AND LOB WEDGE OPTIONS: Each of these wedges comes in 3 loft options ( 48, 50, & 52 degrees) for gap wedge – (54, 56, 58 degrees) for sand wedge – (60 and 62 degrees) for lob wedge. **Read my full Equalizer Wedge Review Now! “Engineered for accuracy. Forged for feel.” That’s the promise they are trying to deliver with these wedges. Hogan says these are built to perform on full and partial shots, as well as handle any shot around the green for the ultimate in versatility. INNOVATIVE WEIGHTING: They have taken some of the weight from the sole of the wedge and distributed it across the back of the clubhead allowing for more penetrating trajectories on full swings and better distance control. Flighting these wedges down is supposed to be much easier than with standard wedges, but effectiveness with partial shots is maintained. PRECISELOFT SYSTEM: These wedges come in every loft from 48 to 63 degrees.